This post made it just under the Halloween wire. Deliberately. I wasn't going to post these recipes at all, but I couldn't resist suggesting two more gooey treats to an already laden holiday. Forgive me. I love being witchy. The first treat is an old recipe.... we used to make it all the time. Very kid friendly. 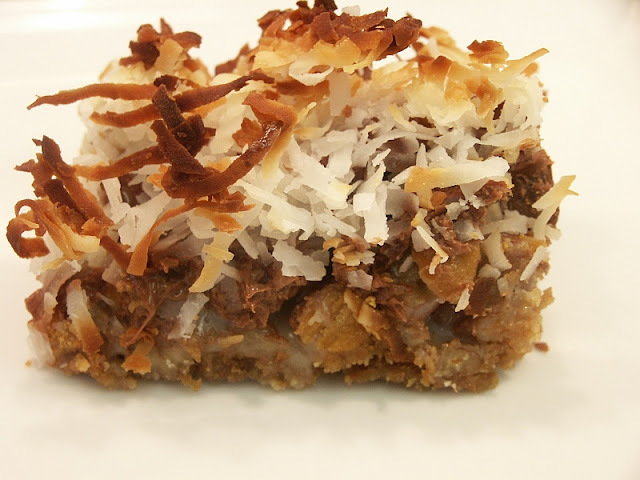 Made with a bunch of gooey, chewy things that most everyone likes, all mixed together. With the added attraction of....wait for it.... sweetened condensed milk. I made it at the last minute so I could take photos and immediately remove it from my reach by giving it to friends with kids (or even some without) just as long as I don't have it around here to nibble on like M & M's or something. Kids love to make it, love to eat it and you can serve the bars (or take them) to any party you're giving or going to this weekend. 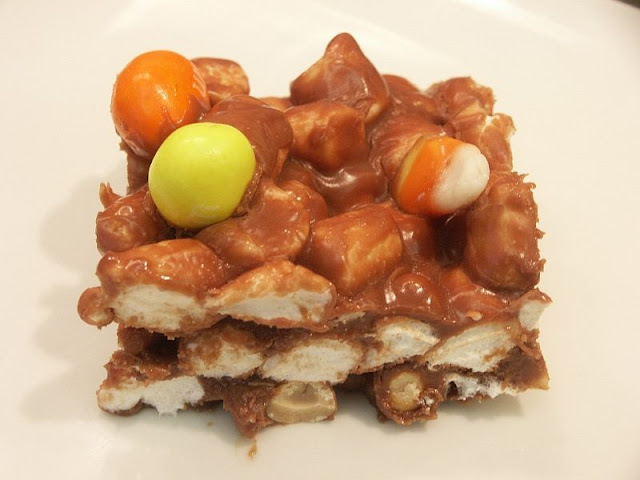 Doesn't need to be for Halloween either- make it for any holiday- just use appropriate candies on the top and change the title to something like Rocky Road Independence Day Bars. Stick a bunch of flags in it. Very adaptable, this recipe. The second treat to avoid tricks is from Smitten Kitchen's cauldron. And she's right to comment that it's seriously sweet and to cut it into small pieces and serve it in those miniature cupcake liners. Again, it has sweetened condensed milk. (Are you noticing a pattern here?) This one takes some baking but Oh. My. So good. I don't want these in the house either! From an adult standpoint, I think treat #2 has a slight edge over treat #1. Oh well, the devil made me post these. Mix the first three ingredients together on the stove, in a microwave or in a double boiler until melted. Put peanuts and marshmallows in a large bowl- mix carefully. Pour the melted chocolate over the peanuts and marshmallows and mix thoroughly. Pour mixture into 9"x 13" buttered pan. Top with orange and yellow M & M's and/or candy corn. Refrigerate 2 hours until set. Cut into squares. Preheat oven to 350°. Line the bottom of an 8" by 8" baking pan with parchment paper; butter the paper. Melt butter and add to the graham crackers. Mix. Pour mixture into the prepared pan. Press down evenly. Bake for 25 to 30 minutes or until light brown. Cool. When I married, I really hit the in-law jackpot. Nana and Buck were kind, loving, caring, generous and every other good thing you can think of. They set the standard for wonderful in-laws. I loved them dearly and in their eyes, I was another daughter. My two sisters-in-law welcomed me into the family the same way- with open arms. We laughed, enjoyed each other and spent many memorable holidays together. I look back on those years with a fond and grateful eye and miss them all so much- I'm sad to say they are all gone now. But two of their many precious gifts to me were confidence and laughter. Those are the most important things anyone can give you. Of course, love is a given. Now Nana was not precisely the Julia Child of her generation but she had some wonderful old family recipes I still use. This fruit compote is one of my favorites. It's thick, rich and extremely sweet so you better keep the portions small. The cold sour cream on top is a necessity as it cuts the sweetness and besides, that cold thick spoonful on the warm dark fruit makes it irrestible. The recipe is amazing, really. You just open a couple cans and one box, squeeze an orange and a lemon, add sugar and that's it. 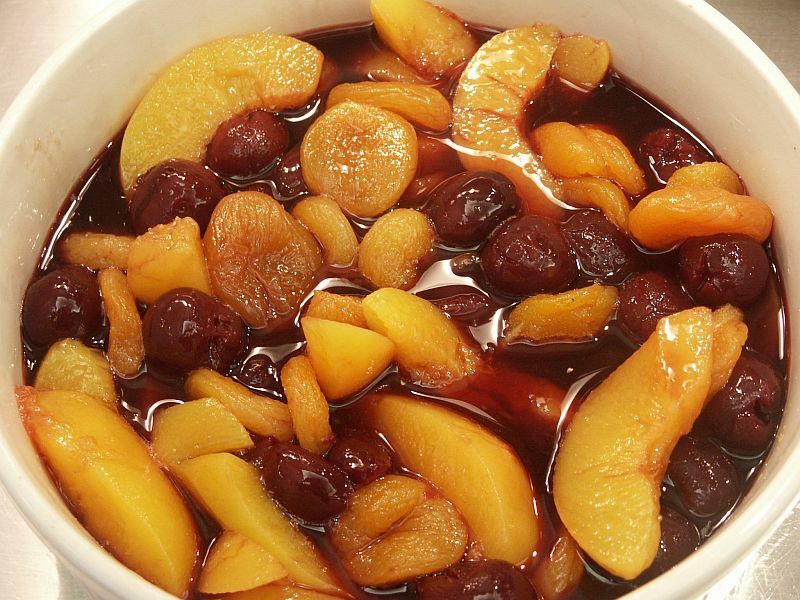 It roasts in the oven for a couple hours... you do some stirring and it caramelizes into a heavenly dark, thick mass of fruit. You aren't going to be able to stop eating it. Let's not discuss calories- you really don't want to know. Mix all the ingredients except the sour cream in a large bowl. Mix well. Pour into a 9" by 9" baking dish and bake at 350° until caramelized. Stir well by turning over the fruit every 15 minutes or so. Takes close to 2 hours. When all the fruit is caramelized and thick, you'll know it's done. 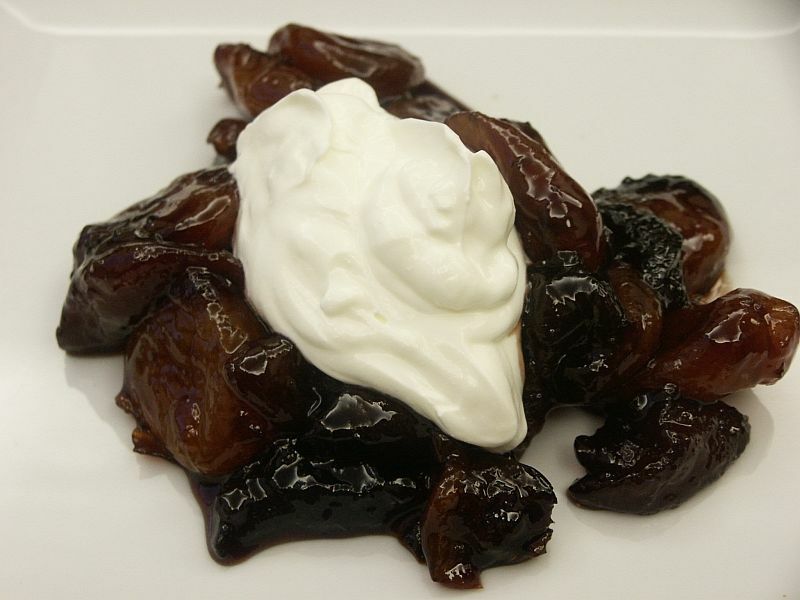 Serve warm with sour cream on top. Do you love stuffing as much as I do? In turkeys, chickens, potatoes, pork chops, apples, mushrooms. In anything. Any kind of stuffing. 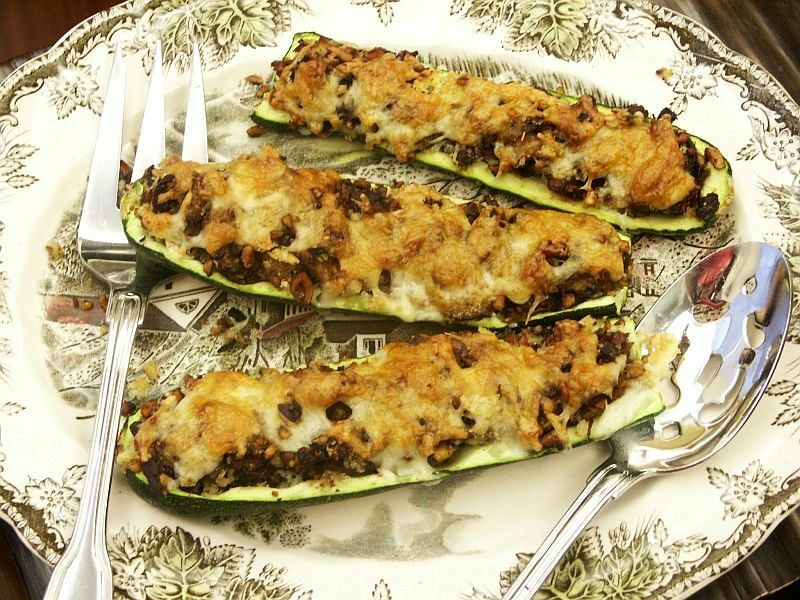 And my stuffed zucchini? This is one recipe that goes on my Thanksgiving table every year. My kids each have their favorite holiday vegetable so we always end up with lots of veggies on the table. They insist upon my brussel sprout dish and someone asked for corn pudding this year. Did you see Heidi at 101 Cookbooks stuffed an acorn squash with it? So I might steal her idea and fill some acorn squash with my own corn pudding recipe. Along with the stuffed zucchini, my table -hopefully- will bring a smile to everyone's face! Of course a sweet potato pie and mashed potatoes are absolute necessities! Anyway- you can get the zucchini all ready to go, refrigerate and then bake them at the last minute. Or they can sit out on the counter waiting if your fridge is too jammed with goodies. The flavor of hazelnuts and shiitake mushrooms together is sheer heaven. Stuff away- you'll get kudos. Halve the zucchini and scoop out pulp, leaving 1/2 inch shells. Chop pulp. Cook garlic, mushrooms and hazelnuts for 4 minutes. Add zucchini pulp and oregano. Cook 7 minutes. Let cool for 10 minutes and stir in bread crumbs and salt and pepper to taste. Place in shells and top with monterey jack cheese. Bake in a 375° oven for 20 to 25 minutes. * Skinning hazelnuts: the traditional way involves roasting them in a 350° oven for 10 to 15 minutes, shaking the pan once in a while. Then you dump the hot hazelnuts in a dish towel, grab the corners to bundle it up and vigorously rub the hazelnuts together. It takes a while, but most of the skins come off. Sort of. The other method is the one I use most often. Boil the hazelnuts in a quart of water with 4 tablespoons of baking soda for 4-5 minutes. Rinse them in a colander under cold water. Some of the skins will come off right then. Others will require you to rub them a little to slip them off. But at least the entire skin comes off. Then dump them in a single layer and bake them in a 350° oven for 10-20 minutes- depending on how much water they absorbed. I use this method when I don't want any skins at all on my hazelnuts. ** Fresh bread crumbs are so much better than packaged. Remove crusts off several slices of day old bread and place in your food processor. Pulse until you get crumbs. Gingerbread has been baked in Europe for centuries and gingerbread making in America has its origins in the traditions of the many settlers from all parts of Northern Europe who brought with them family recipes and customs. 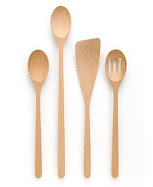 By the nineteenth century, America had been baking gingerbread for decades. But you don't see many recipes for just plain gingerbread anymore. I mean the cake kind of gingerbread. You get gingerbread cookies, bars, houses , muffins, even men- just about anything but the real thing. My mother made it and I bet yours did too. Mine served it with applesauce- but that's because of her German origins. Now my sister thinks gingerbread is boring, boring, boring. I'm trying to convince her to try this recipe for her sewing group next week. There is something so comforting about the smell of gingerbread baking in the oven; the whole house smells divine and spells holidays. Serve it hot or keep it warm in the oven. It's the perfect dessert for a chilly winter weekend. Once again, I turned to Maida Heatter's very first cookbook. 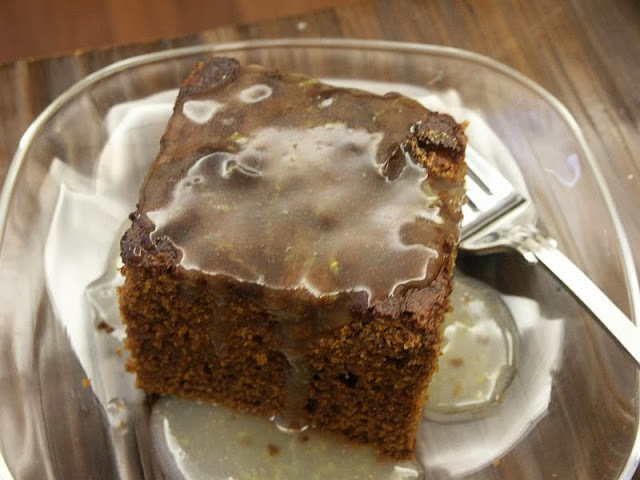 She calls this Moosehead Gingerbread and describes her recipe as one she got from an old-time Maine fishing guide. You'll be surprised at some of the ingredients: coffee, black pepper and dry mustard. I'm telling you, it works. Her recipes are no fail as long as you follow her detailed instructions exactly. And every single one of them is a perfect gem. I love her attention to detail- there are no questions left to ask. This gingerbread is a treat all by itself and a wonderful dessert served with a mound of whipped cream, a little sweetened Greek yogurt and pear or applesauce. As for me, I prefer a simple sweet/sour lemon sauce I found in Martha Stewart's Entertaining. She served it over something called Grateful Pudding. (Which I have served for Thanksgiving off and on- the fun name alone is reason enough to make it, but in addition, it's delicious. Hope you have the recipe. If not, say so when you comment and I will post it before the holidays. It's a magnificent steamed pudding- light in color.) You'll love this sauce over Maida's gingerbread. Boring? I don't think so. Place rack in the center of your oven. Preheat to 375°. Butter a 9 inch square pan and dust it lightly with fine bread crumbs. Sift the flour, baking soda, salt, cinnamon, ginger, cloves, mustard and black pepper together. Set aside. In a mixer, cream the butter. Add the brown sugar and beat a couple minutes. Beat in the eggs one at a time. Scrape down the sides of your bowl frequently. Add the molasses and beat until smooth. Dissolve the coffee in the boiling water. On low speed add the the dry ingredients in three additions and the coffee (remember it's hot!) in two. Beat only until smooth. The mixture will be extremely thin. That's OK. Pour into the prepared pan and bake for 30 to 35 minutes or until the top springs back when lightly touched. Cool in the pan for 10 minutes. Invert on a rack, cover with another rack and invert back again. Serve warm. Combine sugar, cornstarch and salt and whisk until there are no lumps. (It is suggested you make this in a double boiler. I didn't.) Add the hot water and cook 3-5 minutes until thick. Add the butter, lemon juice and rind and continue to cook until smooth. This is very light in color. There's something about a flan that makes my mouth water- might be the caramelized topping- I'm a real sucker for that. I make a super one called Flan Cubano with, you guessed it, sweetened condensed milk. It's rich, velvet smooth and delicious. The recipe came from a Conch (pronounced konk) friend of mine. (A Conch, for the uninitiated, refers to anyone born and raised in the Florida Keys.) Conchs just love their sweetened condensed milk- let's face it, that's where real key lime pies were invented! But for Thanksgiving, you gotta have pumpkin something or there will be an uprising so I turn to my pumpkin flan. I like it for two reasons: the gooey caramelized coating and the fact there's no crust involved. Piecrusts are not exactly my forte... mine're acceptable, but not memorable. After a few mumblings from the more traditional members of my family, they have come to accept this flan as a perfect substitute for pumpkin pie. Same thing really, without the crust. 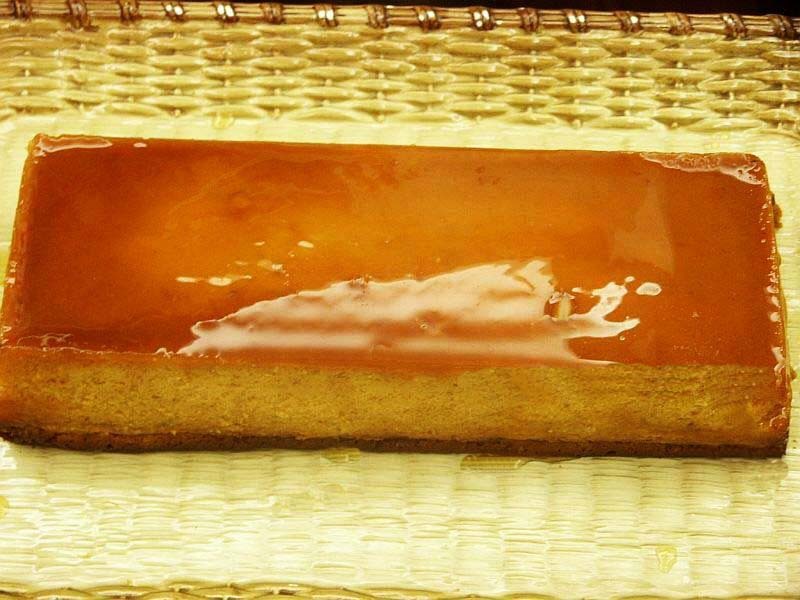 If you've never caramelized sugar for a flan or a crème caramel, I have only one thing to say: BE CAREFUL! It's hot. If it splatters on you- ouch! I speak from experience. No kids in the kitchen when you're doing this; it requires all your attention. Don't be afraid of it (if I can do it, anyone can), just be really careful and follow the directions. Personally, I like the flan plain but for those who like to gild the lily, I make a cinnamon flavored, sweetened whipped cream- easy enough to do. You might also give some thought to a crème anglaise- the flan would look divine sitting in a pool of that luscious sauce. I usually make this flan in a loaf pan (please ignore the shabbiness of my pan in the photo, it's been around the block, much like its owner) but you really can use any shape you want. I even made it once in a ring mold, much as I detest them. No matter what mold you prefer, use a cake tester to make certain it's done in the middle. I put a paper towel in the pan under the water bath-I think it makes for a silkier flan. Serves 8-10 depending on how big your slices are. Combine 2/3 cup sugar with 1/4 cup water in a heavy saucepan and bring to a boil. Continue to boil, shaking the pan lightly and often (don't use a spoon) until it reaches a lovely shade of caramel. Have hot pads ready and pour the caramelized sugar into a loaf pan or ring mold, tilting quickly to cover bottom and sides. It will harden immediately. And crack. Ignore this. Beat eggs with remaining 2/3 cup sugar, beat in pumpkin and remaining ingredients. Pour into the prepared pan and bake in a water bath 350° for 1 hour and 15 minutes. Test center with a wooden tester to make certain it's done. Let flan cool on the counter, cover and refrigerate overnight (or longer) before unmolding. When ready to unmold, take a sharp knife and carefully make certain the flan is not sticking to any sides of the pan. Serve with cinnamon flavored whipped cream, if desired. A few months ago Giada used fregola in a salad and I was totally intrigued. And embarrassed to admit I'd never heard of it. 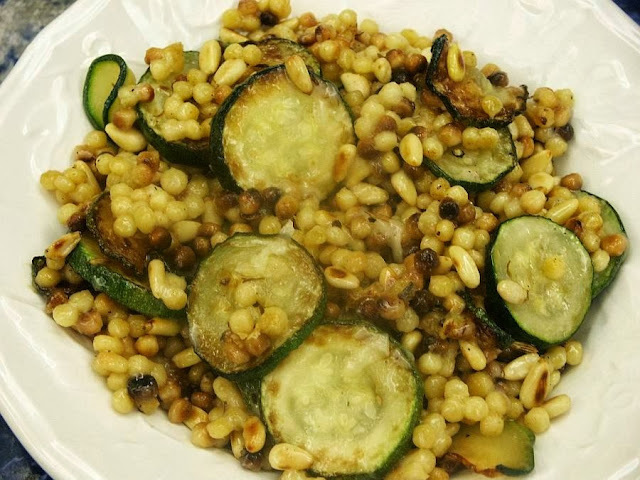 A quick search turned up the following: fregola has an ancient history in Sardinia; it's actually a pasta made by rubbing tiny grains of semolina together with a bit of water, toasting them, rubbing them together again, toasting them again, and so on until you end up with tiny pasta balls. It looks like Israeli couscous, but is more pebbly, less smooth and has all kinds of gorgeous toasty hues. And it has a nutty, wheaty, roasted taste that couscous lacks. Sounds interesting, right? Finding it was another story. Not easy. (Although someone told me Whole Foods had it- mine didn't.) You may have to shop at International grocery stores or Italian delis to get it. I finally gave up and ordered mine from Urban Herbs. Or check Amazon- they can find anything! Dried pasta keeps well, so you might want to stock up on it if you're a fan. Almost all brands are imported from and made in Italy. Why bother? I bet your Italian friends could give you some great answers to that question. But here's what I discovered: you can add it to soups, make a salad with it or use it in a hot side dish. How about using it in tabbouleh instead of bulgur wheat? You could just cook it in some broth and serve it warm with a touch of olive oil and topped with some grated pecorino. In fact, use it any way you might use a small pasta- fregola has so much more flavor and character. I decided to try both a salad and a side dish and I can tell you right now the side dish was far and away my favorite… it was fantastic. You can use up that zucchini you have left in your garden too. And it was just as good the next night- if you are lucky enough to have any left over. Chocolate & Zucchini posted this recipe in 2004- pure luck I found it... thank you, Clotilde, thank you! That's how good it is. This is comfort food personified. No kidding. On a rainy, stormy or snowy day I would love to cozy up with a big bowl of this. I've made it several times already; everyone loved it- and nobody knew what it was! Cooking fregola is simple enough. I used 4 cups of chicken broth (you can use plain salted water too) and when it came to a boil, I added about 1 1/2 cups of fregola. I let it simmer for 12-15 minutes, stirring occasionally, until it was done, but still somewhat chewy. (It puffs up; add more broth if necessary) Drain the fregola and cover it to keep it warm. I promise you, this is a fabulous recipe- addictive even. The recipe is quick, short and to the point. It's finding fregola that takes time! Wash and slice three zucchini very thin. Sauté in a bit of olive oil, with herbes de provence to taste and just enough salt to bring out the zucchini flavor. Add the fregola and pinenuts. Grate liberal amounts of parmesan on top and mix in. Serve warm. Serves 2 with leftovers for lunch.